Maria Teresa Agnesi, an eighteenth-century child prodigy in Milan, attracted the interest of noble patrons, including another Maria Theresa, Empress of the Holy Roman Empire. 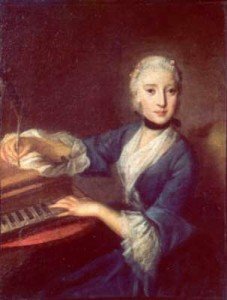 In 1748, Agnesi wrote an opera that premiered in Vienna, and it was reported that the Empress herself enjoyed singing queen Sophonisba’s arias in the privacy of her chambers. The Empress was moved by this dramatic story of a woman in high places, trying to be true to her own desires, feelings, and integrity. 250 years after its first performance, Sophonisba will receive its modern première next weekend on March 25 at Gordon Chapel in Old South Church, Copley Square, at 7 pm (and on March 26 at First Parish Unitarian Universalist Church in Arlington, also at 7 pm). The concert performance by the distinguished Boston-based ensemble La Donna Musicale will offer highlights and key dramatic moments of the powerful opera seria. The story is based on Roman history during the Punic wars: Queen Sophonisba (of Carthage) has been compelled to marry for political reasons, but then when her true love Massinissa is victorious in battle, she is then able to be joined with him. But vengeance and power struggles ensue. It features striking virtuoso arias, with the cast of four singers. Renée Rapier, contralto, the heroic Queen, won the most recent Metropolitan Opera Regional Competition. Robert Crowe, male soprano, plays the Queen’s true love, Massinissa, torn between the demands of war and politics and his own feelings. Crowe was the first male soprano to be a National Winner of the Metropolitan Opera Competition, and the New York Times has praised his “staggering gifts” as a singer. The four singers are accompanied by an ensemble of strings, winds and continuo, but the focus is on the remarkable coloratura singing, powerful both in its technical and expressive demands on the singers. In listening to clips from last fall’s opera, Ulisse, Renée Rapier impressed with her luscious contralto, rich with both sensuality and layers of profound emotion. And in other recordings of Robert Crowe, I could feel the palpable electricity he generated in the pyrotechnics of the virtuosic style. Rounding out the cast are Pablo Bustos, tenor, and Mary Gerbi, mezzo-soprano. Gutiérrez continued, “Julianne Baird, the soprano who was featured in Ulisse, said, in a recent radio interview, that her work with us is the most interesting work she is doing, because we are unearthing this good music. She’s not in this concert, since the soprano is the male soprano, the warrior role, but Julianne will be with us again in the future. And we have these important scholars who we collaborate with, Robert Kendrick and Rebecca Messbarger. Given this long piece on “Sofonisba” why no review, yet, of the Friday performance in Boston? The BMInt reviewer attended the March 26th performance in Arlington. Her review should be forthcoming. We’re pleased you’re looking forward to our oracle’s utterance. If we were looking forward to a performance we might want to hear from the oracle. But after the fact?